For the British actor of a similar name, see Peter Sellers. 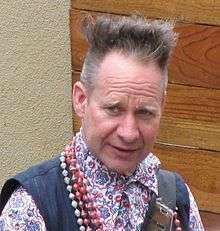 Peter Sellars (born 1957) is an American theatre director, noted for his unique contemporary stagings of classical and contemporary operas and plays. Sellars is professor at UCLA, where he teaches Art as Social Action and Art as Moral Action. Sellars was born in Pittsburgh, Pennsylvania, and attended Phillips Academy and, subsequently, Harvard University, graduating in 1979. As an undergraduate, he performed a puppet version of Wagner's Ring cycle, and directed a minimalist production of Three Sisters, with mature birch trees on the stage apron at Loeb Drama Center and Chopin Nocturnes played on a concert grand piano seen through a suspended gauze box set. Sellars's production of Antony and Cleopatra in the swimming pool of Harvard's Adams House brought press attention well beyond campus, as did the subsequent techno-industrial production of King Lear, which included a Lincoln Continental on stage and ambient musical moods by Robert Rutman's U.S. Steel Cello Ensemble. In his senior year, he staged a production of Nikolai Gogol's The Inspector-General at the American Repertory Theatre in Cambridge, Massachusetts. This was followed during the summer of 1980 by staging of Don Giovanni, cast, costumed, and presented to resemble a blaxploitation film, with Don Giovanni partying almost-naked (underwear only) and shooting heroin. This was performed under the aegis of the Monadnock Music Festival in Manchester, New Hampshire. Opera News hailed it "an act of artistic vandalism". In the winter of 1980, a production of George Frideric Handel's Orlando, again at the American Repertory Theatre, brought him to national attention—perhaps because of the novel concept of setting it in outer space. Later, Sellars studied in Japan, China, and India. Sellars served as director of the Boston Shakespeare Company for the 1983–1984 season. Among his productions were an influential Pericles, Prince of Tyre and a staging of The Lighthouse by British composer Peter Maxwell Davies. In 1983 he received a MacArthur Fellowship. In 1984, he was named director and manager of the American National Theater in Washington, D.C. at the age of 26, a post he held until 1986. During his years in Washington, Sellars staged a production of The Count of Monte Cristo, in a version by James O'Neill, featuring Richard Thomas, Patti LuPone, Zakes Mokae, and many other performers. The production had a set design by George Tsypin, with costumes by Dunya Ramicova, and lighting by James F. Ingalls. He also directed productions of Idiot's Delight by Robert Sherwood and Sophocles's Ajax, as adapted by Robert Auletta. He was Artistic Director of the 1990 and 1993 Los Angeles Festivals, presenting works of talented artists like the late Iranian director Reza Abdoh, and playwright Frank Ambriz. Sellars subsequently staged a series of Mozart's operas Così fan tutte (set in a diner on Cape Cod), The Marriage of Figaro (set in a luxury apartment in New York City's Trump Tower), and Don Giovanni (set in New York City's Spanish Harlem, cast and costumed as a blaxploitation movie), in collaboration with Emmanuel Music and its Artistic Director, Craig Smith. The productions were met with great critical acclaim, recorded in Austria by ORF in 1989, subsequently televised by PBS, and later revived at MC93 Bobigny (Paris) and the Gran Teatre del Liceu (Barcelona). Sellars has directed one feature film, The Cabinet of Dr. Ramirez, a silent color film starring Joan Cusack, Peter Gallagher, Ron Vawter, and Mikhail Baryshnikov. He was featured in Jean-Luc Godard's film of King Lear, which he co-scripted. Sellars was invited to the Salzburg and Glyndebourne Festivals, where he mounted productions of various 20th-century operas, notably Olivier Messiaen's Saint François d'Assise, Paul Hindemith's Mathis der Maler, György Ligeti's Le Grand Macabre, and, with choreographer Mark Morris, the premiere of John Adams's and Alice Goodman's Nixon in China and The Death of Klinghoffer, and the premiere of Kaija Saariaho's first opera, L'amour de loin. Other projects in which he has been involved include stagings of Handel's opera Giulio Cesare and oratorio Theodora, Stravinsky's A Soldier's Tale with the Los Angeles Philharmonic conducted by Esa-Pekka Salonen, I Was Looking at the Ceiling and Then I Saw the Sky and The Peony Pavilion. He directed an important production of The Persians at the Edinburgh Festival in 1993, which articulated the play as a response to the Gulf War of 1990-91. In 1998, Sellars was awarded the Erasmus Prize for his work combining European and American cultural traditions in opera and theatre. In 2005 Sellars was awarded The Dorothy and Lillian Gish Prize, given annually to "a man or woman who has made an outstanding contribution to the beauty of the world and to mankind's enjoyment and understanding of life." In August 2006, he directed a staged performance of Mozart's unfinished opera Zaide as part of the Mostly Mozart Festival at Lincoln Center in New York; the pre-concert discussions were about contemporary slavery and the prospect of abolishing it, as well as Mozart's egalitarianism and opposition to slavery. In late 2006, Sellars organized the New Crowned Hope Festival in Vienna, Austria as Artistic Director (the festival was part of Vienna Mozart Year 2006), and directed there the premieres of Saariaho's oratorio La Passion de Simone and Adams's most recent opera, A Flowering Tree, also in Vienna. In 2007, Sellars delivered the "State of Cinema" address at the 50th San Francisco International Film Festival on April 29. He introduced the screenings of Mahamat Saleh Haroun's Daratt and Garin Nugroho's Opera Jawa, two of the New Crowned Hope films and it also screened Jon Else's documentary, Wonders Are Many, which features an account of Adams's and Sellars's creation of the first San Francisco production of Doctor Atomic. An extensive commentary by Sellars is included in the 2007 DVD of Grigori Kozintsev's King Lear by Facets Video. In early 2009, Sellars co-curated a contemporary art exhibition of work by Ethiopian artist Elias Simé at the Santa Monica Museum of Art, a kunsthalle in Santa Monica, California. His Othello, starring Philip Seymour Hoffman as Iago, showed in the Fall 2009 season at New York City's Public Theater. In 2011, Sellars directed a production of John Adams's opera Nixon in China for New York's Metropolitan Opera. This was broadcast in many theaters around the world in HD on February 12. During a backstage interview in the first intermission, Sellars referred to the fall of President Hosni Mubarak which took place in Cairo on the previous day, comparing it to the momentous time when Richard Nixon first met with Mao Tse-tung in Peking, opening diplomatic and trade relations between the United States and the People's Republic of China. Summer 2011 he directed the opera, Griselda (Vivaldi), at the Santa Fe Opera in Santa Fe, New Mexico. In 2011, Sellars' work was documented in John Freeman's book, The Greatest Shows on Earth: World Theatre from Peter Brook to the Sydney Olympics. Libri: Oxford (ISBN 978-1-907471-54-4). For his collected work in the field of opera and music productions, Sellars was awarded the prestigious Swedish Polar Music Prize of 2014 alongside Chuck Berry. Sellars wrote the libretto for John Adams's opera Girls of the Golden West, and he will direct the premiere at San Francisco Opera in November 2017. Sellars was inspired to the topic whilst researching for production of Giacomo Puccini's opera , La fanciulla del West. "In the TV interview Saariaho named director Sellars as the hero of the performance. Aside from the bitter and violent war events, Sellars has added to the opera a dimension of hope that the conductor [sic] herself had not envisaged in the first place." In 2001, Sellars briefly directed South Australia's Adelaide Festival of Arts before being replaced by Sue Nattrass. Sellars' brief directorship remains the most controversial in the festival's history. He claimed the reason behind his shock departure was that he was "impeding the forward progress of the Festival". "Peter Sellars asked the community to take a leap of faith for his particular Festival which was based around themes. He also rejected what he termed 'the shopping trolley' approach to Festivals. We took him on faith and embraced his dream, but soon it became apparent... that the emperor had no clothes. Critics gave the programme the thumbs down, which finally precipitated action on the part of the Festival Board." ↑ The Dorothy and Lillian Gish Prize, official website. ↑ Kaija Saariaho. Interview in Bonus materials of L'Amour de Loin. Deutsche Grammophone, 2005. DVD. ↑ "Peter Sellars resigns from Adelaide Festival", Gramophone.co.uk, November 13, 2001. ↑ The "shopping trolley" approach to festivals involves choosing existing works that have been presented elsewhere in the world to critical acclaim. Favorini, Attilio. 2003. "History, Collective Memory, and Aeschylus' Persians." Theatre Journal 55:1 (March): 99-111. Jobson, Kristi L., "From Hilles Elevator to the ART", The Harvard Crimson, January 10, 2003.